While flying home yesterday, I decided to take a departure from my normal novels and investigate a topic that I personally find extremely important and that has arisen in several conversations this week. Scott M. Gibson’s Should We Use Some Else’s Sermon? : Preaching in a Cut-and-Paste World examines the history of plagiarism in the Church’s pulpits and focuses specifically on the responsible use of easily available sermon websites such as sermoncentral.com. I am not a preacher or a pastor. I do not know the pressure of attempting to prepare a weekly sermon. However, I have been a faithful church attender. I have sat under the pastorate of men who had never spent a day in seminary and did the best they could to faithfully preach the Word of God under powerful anointing. I have also had the privilege of hearing wonderfully intelligent men present a finely-crafted and carefully researched sermon that was relevant and impactful to their specific congregation for that moment in time. Both scenarios have significantly contributed to my spiritual growth. Unfortunately, I have also found myself listening to a pastor present sermons found online. While the sermons were well written, they did not seem to have the power of personal conviction. Instead, I felt as though I was listening to a book report. How did I learn that the sermon was coming from a web service? Like most young adults in our society, I turned to Google. A quick search for a specific statement turned up the entire sermon — I followed along on my browser as the speaker read the material word for word. I found myself wondering if such presentations were ethical. If such excessive use of one person’s material was used in a presentation or document in any other field, it would be severely frowned upon — even if credit was given to the original author. Why was it now an acceptable practice that should not be questioned just because a “good man” was delivering it from a church pulpit? Are the ethics of the Church diminished in comparison to that of other professional fields? 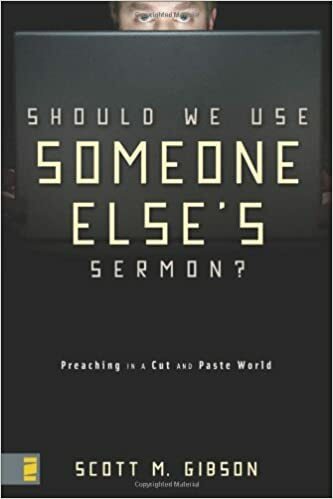 While Gibson’s book focuses on ministers who present significant portions of their sermons — or even preach the entire sermon — without giving credit to the author they are “borrowing” from, he does address the current trend of using sermon internet services. Gibson quotes Eugene Lowry, Emeritus Professor of Preaching at the St. Paul School of Theology, who states that “While not plagiarism, using these sermons [from internet services] is thievery of another kind….When we substitute purchased sermons for that personal reflection, we betray people’s time and trust and our own integrity. It would be more honest to have the real writer tape [on audio recording] the text, and to play that tape for the congregation. For the pastor to present someone else’s sermon as if it were the result of his or her own discipleship, training, and theological commitment is to bear false witness.” (Gibson, 71-72). Gibson follows this discussion with a observation from Ken Garfield, a reporter with the Charlotte Observer. In his 2002 article entitled “Internet Inspiration for Preachers,” Mr. Garfield concludes that “If all this leaves you nervous, you’re not alone. Preachers surfing for inspiration worries me too. There’s a risk of outright plagiarism, of course. But a subtler danger is at work — pastors choosing to take a shortcut to a sermon rather than putting in the effort that a congregation has a right to expect of its spiritual guide.” (Gibson, 72). Gibson finally summarizes his feelings about the use of internet sermon services with this statement. “What is the bottom line when it comes to these and other resources? A responsible preacher does the majority of his or her own work, possibly stimulated by various preaching resources [emphasis added], and prays to God for wisdom, guidance, and discernment.” (Gibson, 72) Personally, I fully agree with Gibson’s summary. Using resources is not the problem; actually, it should be applauded. The problem is when a minister fails to use the resources responsibly and puts all of their confidence in one man’s interpretation rather than faithfully doing the research on his own and then applying it to the Word as he understands it. I would much rather hear a less eloquent sermon that has come from a pastor’s wrestling with the text than reading what someone else has written. You see, I would rather know that you had spent more time reading the Word and listening to the direction of the Holy Spirit, Mr. Minister, than reading the thoughts of another man. “All Scripture is God-breathed” (2 Timothy 3:16)……not all sermons crafted by fallible men. Should We Use Someone Else’s Sermon? is certainly not the final authority on this topic. However, it does begin to raise an important question for the modern Church that must be addressed by ministers, lay leadership, and congregants alike and no longer swept under the carpet. The year began with reading Joyce Meyer’s Seven Things That Steal Your Joy. In this Biblically based book, Meyer explores those things in our lives that steal the joy that comes from our relationship with Christ. Thankfully, Meyer doesn’t stop there; after each joy-stealer, she presents a chapter on how to reclaim the stolen joy. This isn’t a book that I would normally gravitate to, but thought it would be a good reminder to start the year off on the right foot. I’m glad I read it and plan to be on the lookout for Joy-stealers lurking around my life in the coming months. In case you are curious, here are the Seven Joy-Stealers that Meyer identifies. Life Everlasting is the second volume of Whitlow’s Santee series and shares many of the characteristics of the first novel. For my thoughts on that book, check out last week’s post. There’s really not a lot that I need to add that I have not already mentioned there. When I reached the end of Life Everlasting, I found myself with several questions remaining. While the situation between Rena and Baxter has been partially resolved, the door is wide open for another volume in the series. Alexia’s relationship with Ted has reached a new plateau despite unexpected tragedy for the music minister. I really enjoyed these characters. Mr. Whitlow, if you happen to stumble across my humble blog, this fan (as well as many others based on the comments I found on your website) would welcome the opportunity to return to Santee to check in on our favorite divorce lawyer and those that surround her. The end of the semester was extremely busy this term and my reading life had to take a back seat. I’m happy to fall back into my routine and share with you the marvelous story by Robert Whitlow. Life Support is the first of Whitlow’s novels featuring Alexia Lindale, an attorney in South Carolina. Alexia specializes in divorce cases, but finds herself in a new situation with her latest client, Rena Richardson. While on a hike, Rena’s newlywed husband, Baxter, plummets over a cliff to the rocks below. Rena immediately assumes her husband died in the accident; when medical personnel arrive, they discover that Baxter is severely injured and comatose. A legal battle ensues between Rena and her powerful father-in-law over whether or not to terminate life-sustaining medical assistance. The novel thrills with intrigue, deception, and legal twists throughout. As in Whitlow’s other novels, spiritual truths are finely woven into the book’s fabric. I found myself pausing in the midst of my reading to meditate on the insights Whitlow expresses. As a pianist, I am especially fond of the character of Ted Morgan. Ted is a music minister at the church Alexia has begun attending. A gifted pianist, Ted’s improvisations are musical expressions based on Scripture that give birth to Alexia’s faith journey as well as music therapy to the comatose Baxter. With expressive description, Whitlow vividly captures the connection between music and the holy presence of Almighty God that can only be fully understood through first-hand experience. Life Support ends with the ultimate cliffhanger that (I hope) will be resolved in the second book of the series, Life Everlasting. I see a trip to the library in my immediate future to continue the story of Rena, Baxter, Alexia, and Ted.